Do you want press for your business? Yes, please! This “Social and Mobile PR Secrets” session from SMX East will help you use social media in traditional and new ways to reach and influence the media. New opportunities to be covered by today’s speakers include making sure your content is mobile-friendly and targeting the media through paid Facebook promotions. Why am I creating the content? Generally, people care because they have a problem that needs to be solved. Before you start approaching potential writers, go back to the basics. What does the company do, what problem does it solve, who are you solving it for, and how can you present the context to the audience and illustrate the solution? When you answer those questions, look at the publications you’re targeting and then research that publication to see what is the most popular content there. Fit your story into that format. When they write about you, promote the heck out of it. Writers are trying to get their content to have tons of views and shares. If someone takes the time to write about your company, take that third-party endorsement and share that with your current audience. You might grow a new audience. Use Outbrain to promote it. Make it a promoted tweet. How do you meet press and get started with outreach? Go to events, especially targeted events, and meet press writers in person. Find a local media group meetup and go to it. Those press people also probably have social profiles you can find. Look at who is writing about your competitors and who is doing promoted posts about your competitors. 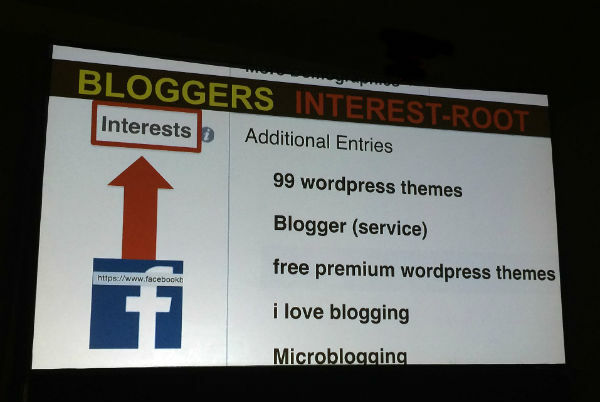 Search for the word “sponsored”; that means that they do sponsored posts and are open to commercial opportunities. Your email inbox is constantly full of spam. Spam is from someone you don’t know about something you don’t care about. If you get to know someone and what they like, then your subject line/title can be one line about something they like and care about. Newlands introduced the concept of public relations. There’s overlap with social, mobile and visual and opportunity to reach your customers and prospects. It’s critical to have this as part of your strategy. Mobile-friendly content is important to them. Faster turnaround times for journalists. Social media is a major influence. Journalists are looking for original video (people and products). Having a small newsroom staff is a pain point, so save a journalist’s time by making his or her job as easy as possible. Mobile devices are the preferred method of reading. Even though you may be crafting something from a laptop or desktop, your reader is probably reading it from their mobile device. Buyer says 78 percent of Facebook users access the content from their mobile phones at least once a month. Think mobile first! Social advertising is predicted to grow to $35.98 billion by 2017. Journalists are trying to grow their own following — can you share their content? They’ll notice you and think to look at you as a source. 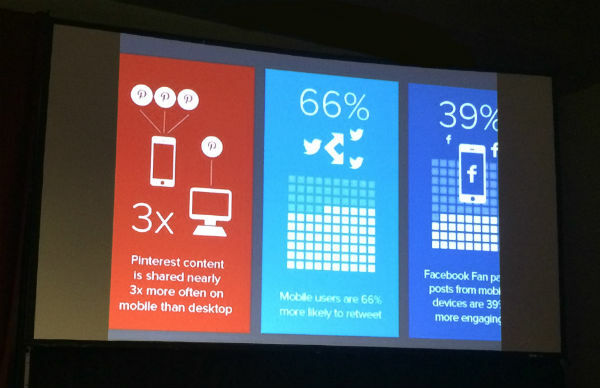 Time online is more common on mobile than desktop. Pin featured news to the top. The majority of media writers will look at your branded social media to see what’s new and happening with your company. Think of your cover images like magazine covers. Magazines change their cover monthly; it’s not the same every month. Guy Kawasaki said it best in his keynote yesterday — use it as a narrative. It’s all about the BIO, baby. Share all your news with a solid visual. Video, video, video. She can’t say enough about video, video, video. 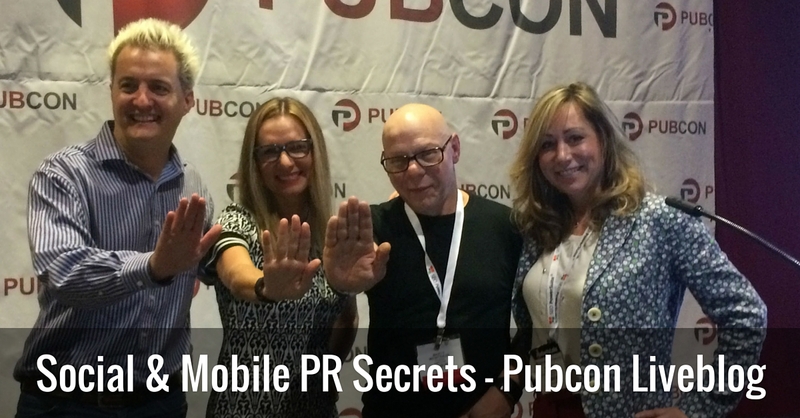 Marty Weintraub is doing an amazing job with his video news team. aimClear has a video production studio with weekly distribution and on-topic reporting. Treat your brand the same way and tell news on your industry, not your company. Create a podcast of your blog. Turn your Facebook cover image into a CTA. Use tools. Tools like TweetDis help users tweet your content more easily. 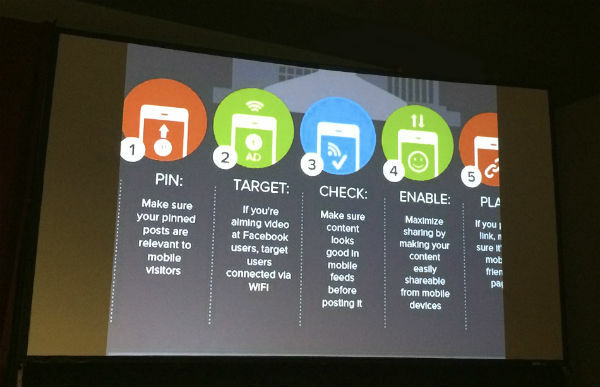 How can you optimize social for mobile? Instagram Video – use Instagram to tell your brand story. Make it viewable on all screens. Include mobile calls to action (CTAs). Pay attention to fonts and sizes. Get to the point very quickly. Look at things like load time and high-res visual quality. Use the mobile apps that your audience uses. Giving equal weight to everything will cause you to burn out, so focus. Blab.im – This one’s a new addition, still in beta but gaining popularity quickly. When she submitted her presentation at the time it was due a month ago, Blab wasn’t even around. 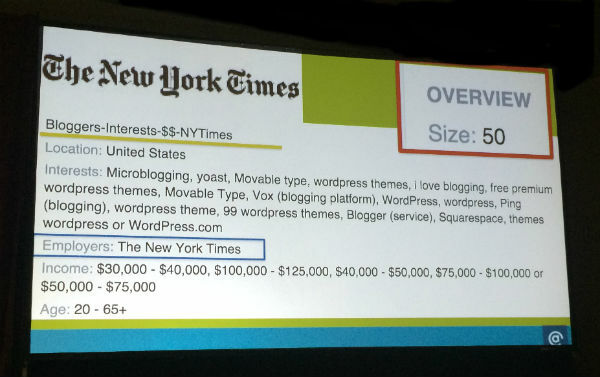 Buy ads to dominate exposure. Make sure you’re watching your reputation as it evolves on social media. 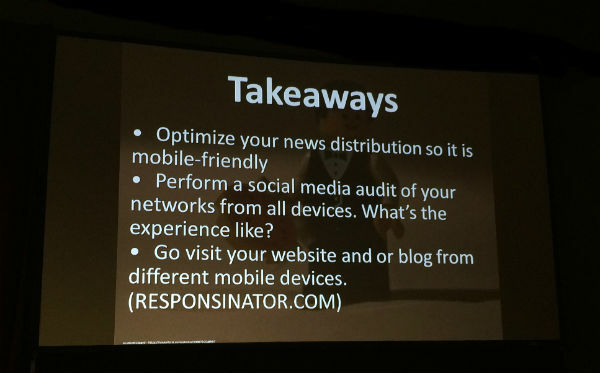 Do a mobile PR audit on social media by going through your assets to see if you’re optimized. Check out new channels and see if they make sense for your brand. For example, Facebook just launched Mentions, which is currently only available for verified celebrities. Little tweaks can make a huge difference. Continue to evolve, create benchmarks, monitor and adjust. In three months things may be different, so stay on top of the trends. This is all new material and he’s excited to share it with us. There will be a download of an import into Facebook Power Editor. He’s going to talk about targeting media roles and influencers. “Rooting” — a new vernacular he hopes we’ll become familiar with by the end of this. Know what you call “branding” if you’re talking to media people? Public relations. This applies to all channels with psychographic targeting. Google, Blue Kai, Twitter and Facebook. When you’re fishing for journalists, what you pitch has to be more than good, it has to be stunning. Ask yourself, does anybody care about this or is it an inside joke? 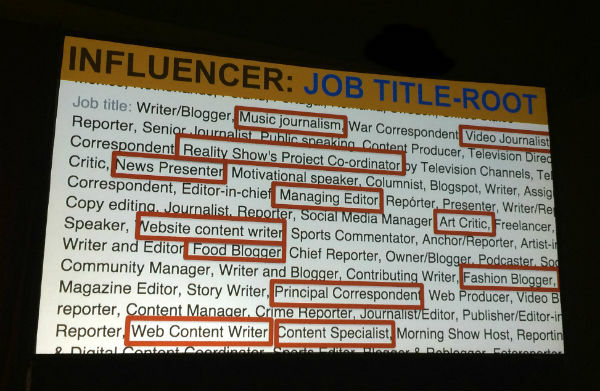 Persona rooting tactic #1: Job titles. Next, segment the job titles bucket (the root) by interest and income. Look for clarifiers in the interest bucket that signal they’re a do-er (like “writer”). He loves rooting things in the behavior bucket because it’s intent-based. 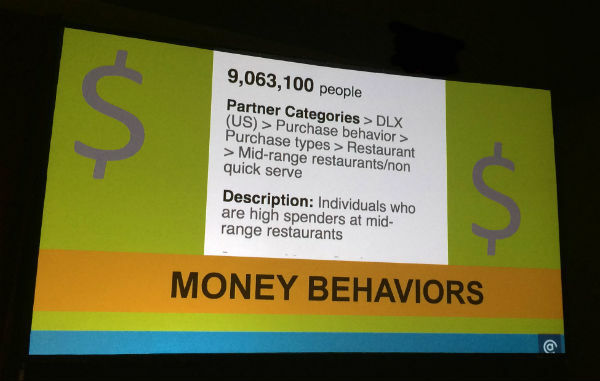 When you root persona in the behavior bucket, there’s often money and stuff they like to do. Little Blue Book explains sources, uses and targeting slices, excluding Facebook, Google, Twitter. 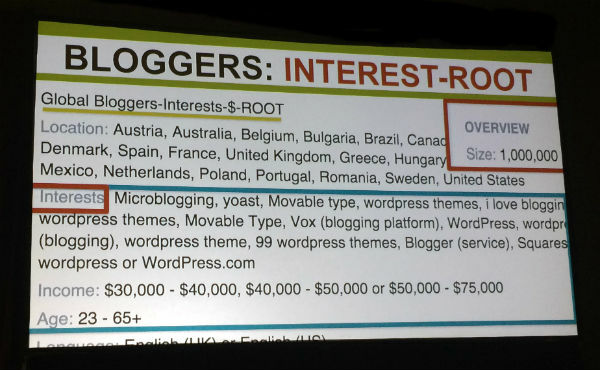 If you take business marketing as the behavior on top of the blogger interest root, you’re focusing your target. 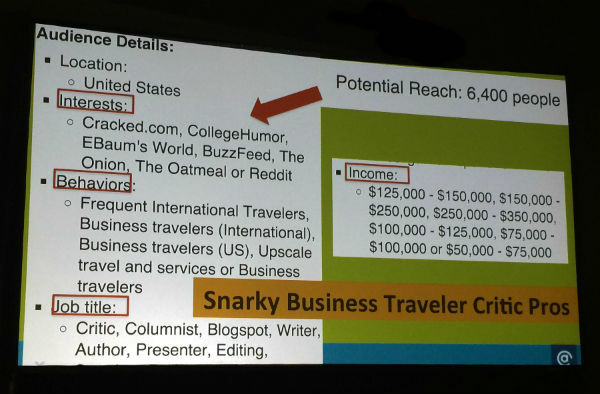 Add industry, such as “arts, entertainment, sports and media,” if that’s your target. You can get “creepy” next. 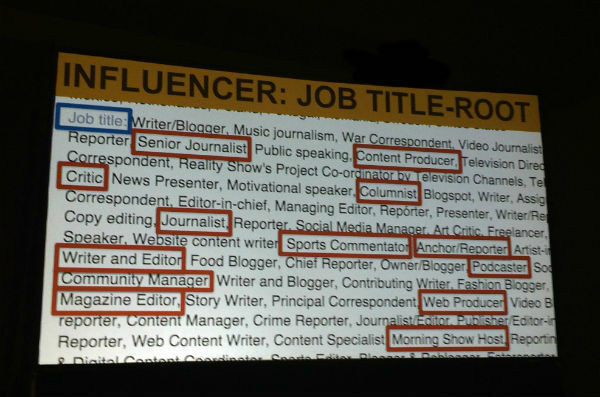 How about starting from bloggers as interest and sports and media as industry and then add all the sports teams as employers. Now you’ve really targeted a group. You can find the top 50 newspapers in America in the employer bucket. As you drive people into the system, cookie them for retargeting or remarketing. It’s your job to keep following them and run search campaigns for them and save them as lists. 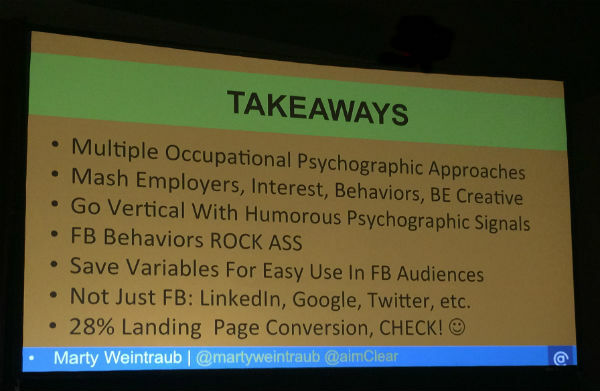 Want to subscribe to the Super Secret Psychographic Social Distribution Weekly Tip Sheet? Get one of these pieces of targeting every week. Email Marty at aimclear.com.